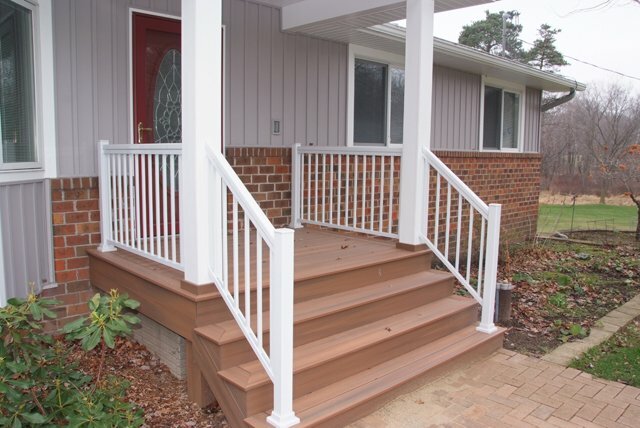 Decks - Coverup Enclosures is a General Construction Remodeling Company in Mid Michigan serving the Areas of Grand Rapids, Lansing, Ionia, Lowell, Grandville, Greenville, Portland. High quality work and energy efficient work and products have kept us open for over 25 years. CoverUp Enclosures knows that it’s a great American tradition and dream to expand your living space by adding a deck. Most homeowners today see outdoor living space as a must-have, and a well planned deck can add a lot of enjoyment to your home. CoverUp Enclosures will help you factor in all the critical design issues, helping you pick out the right material for your budget and lifestyle, and building a deck that will stand the test of time. They will make sure your new deck is planned out properly so that you can realize your dream of relaxation. The representatives from CoverUp Enclosures will review the area with you and assist in deciding size, style, any steps needed, arbors, deck benches, privacy walls. They work with only trusted brands, have a wide variety of materials to choose from, but most importantly they stand behind their workmanship. Whether you decide you want to go with a classic wood design for the more natural rustic look, or a more maintenance free PVC type material, rest assured CoverUp Enclosures will be using nothing but premium materials. Depending on the color of your home or just your own personal preference, CoverUp Enclosures offers an assortment of finishes for your deck. It’s all about planning, and you will appreciate the expertise of CoverUp Enclosures. Based on your area, budget and your personal likes and dislikes, they will help you design the deck you have always dreamed of. Whether you are looking at a whole new deck, or a complete remodel project on your existing deck, CoverUp Enclosures can do it. Looking for steps? Arbors? Privacy walls? Deck benches? CoverUp Enclosures can make these part of the overall unique design of your new deck.